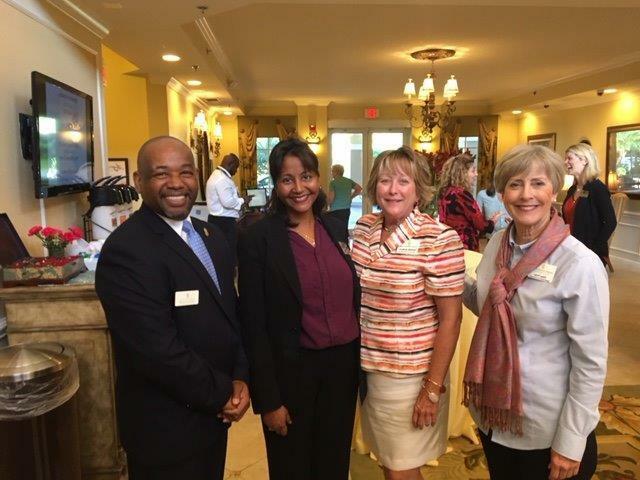 Photo from Left to Right: James Butler, Account Executive for Sonas; Sharon Singh, RN, Director of Nurses for Atria Park of St. Joseph’s; Denise Dublin, Director of Operations for Sonas; Ellen Peitz, Executive Director Community Relations for Sonas. Atria Park of St. Joseph’s was the beautiful location of a delightful French wine tasting event featuring “Wine Around the World.” Sumptuous offerings included wine and food pairings featuring unique selections from France prepared by Atria Park’s fabulous chef. Guests were invited to “take a sip around the world” and a wonderful time was had by all! Representing Sonas Home Health Care were Denise Dublin, Director of Operations, James Butler, Account Executive and Ellen Peitz, Executive Director for Community Relations. The team enjoyed the food, fellowship and lovely wines offered. Just four miles from the beach, Atria Park of St. Joseph’s combines the comforts of home with the amenities of an elegant resort. Shopping, cultural venues and medical centers are close by, and because the location is only minutes from major interstates, it’s easy for family and friends to visit. Atria’s tenured staff provides discreet assisted living services 24 hours a day. Life Guidance® memory care for those living with Alzheimer’s or other forms of dementia is also offered. Residents may choose from more than 200 social events every month, including daily Mass in the chapel and regular outings. Whether laughing with friends in the bistro during happy hour or joining neighbors for a trip to the Mounts Botanical Garden, the people who call Atria St. Joseph’s home share daily opportunities to enjoy a connected, well-rounded life. For more information about Atria Park of St. Joseph’s, log onto www.atriaseniorliving.com.